The benefits of both wooden and plastic Adirondack chairs have many similarities. 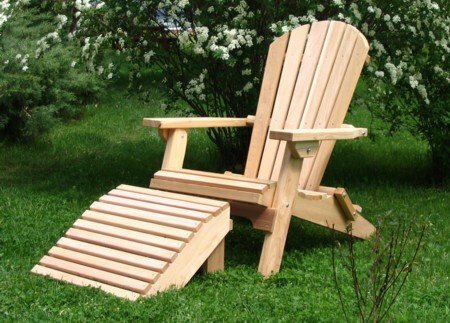 Both will offer the classic and comfortable Adirondack design that is inviting and comfortable at the same time. Both can be found or finished in multiple colors, from classic white to bold colors, but there are some compelling reasons why a person would want to choose one over the other. Here are the benefits of wooden or plastic Adirondack garden chairs for review before making your final decision. A decent quality plastic Adirondack chair will cost a mere fraction of what a quality wooden Adirondack chair costs. If money is a key reason, plastic chairs will save you a bunch. Expect to pay about one-fourth of the price or less for plastic vs. wooden chairs. Consider the total cost, however, as a quality wooden chair will last for many years as long as the finish is kept in repair. A plastic chair, on the other hand, has a lifespan that is shorter and will need replacement sooner. When it comes to maintenance of Adirondack chairs the difference is very clear. A plastic chair will only require an annual cleaning with regular soap and water to keep it clean. Since there are no parts like screws there will never be anything to come loose. Wooden chairs, however, will need a fresh finish every so often. How often depends on where your chairs are located. Chairs totally exposed to sun and rain will need a new coat much more often than those left under a covered porch. Maintenance on wooden chairs may include a new coat of paint which takes a bit of effort. If storage over the winter is an issue, the way that Adirondack chairs stack is important. Nearly any plastic Adirondack chair will be stackable with others of the same model. Wood chairs will rarely stack, though if you shop around you can find wooden Adirondack chairs that have been made to be stackable. Shop carefully, however, as stackable wooden chairs may not be the best in construction or have the classic Adirondack style since certain changes are needed to offer the stacking feature. It's easy to find plastic chairs in colors, though only in a few. For the greatest flexibility and the perfect match for your landscape you can't beat wooden chairs painted to your specifications. Custom paint jobs on Adirondack chairs that match a home are a striking feature that can improve front yard curb appeal and tie areas of a landscape together. For this, wood is the way to go. This one is a matter of personal preference. Plastic may feel soft to some people - even like it has some give. That really depends on the thickness of the plastic that is used. Wood may feel much more supportive to others. There are some fairly weak plastic Adirondack chairs out there, so if you need support for a heavy person or climbing young kids, wood is the solid choice. For those that do decide on plastic, it's a very good idea not to buy the cheapest chairs for sale. They are the most likely to break under pressure, especially on the overhanging arms or in the seat. Always choose a quality chair for a long-lasting piece of furniture. The great thing about Adirondack chairs is that they are so comfortable. So much so, in fact, that you'll want to move them around from time to time as your desired sitting scene changes. When that time comes, a plastic chair is light and simple to move. A wooden chair weighs quite a bit, making it difficult for some to move around the yard. On the other hand, a heavier wooden Adirondack chair won't blow away in a storm the way a plastic one may. If you are handy there is a great way to save some money on wooden Adirondack chairs. While plastic Adirondack chairs are a great value in furniture for the outdoors and need very little maintenance, wooden chairs don't have to break the bank. There are two options that will save you money; kits and plans. You can find a kit that comes with pre-cut pieces ready for assembly and finishing. They will save you money and allow the color you pick out. Plans are also easy to find online if you know how to work with wood. Either ca save you money, but you will need to be handy to get a good result. While you're thinking about Adirondack chairs, here are some other neat options worth thinking about. You can find small kids chairs in the same style that look really nice next to the full-sized chairs. Consider adding an Adirondack side table between two chairs for a nice spot to set the paper or a glass of lemonade. The addition of an Adirondack footstool is a comfortable choice that will make you want to spend even more time in your new chair. All of the options will enhance the new seating area you are about to create. There is really no wrong choice to make when shopping for a new Adirondack chair. This style looks so great and is so comfortable that you are likely to be happy either way. Still, here is a quick summary that may help. Whether you choose plastic Adirondack chairs or decide to go with wooden Adirondack chairs, you had better get ready to spend some time sitting in comfort from now on. The benefits of wooden or plastic Adirondack chairs are different, but one or the other is sure to suit your needs. If you've decided to go with wood, buy a quality chair so that it will last for years. This Amish crafted chair is a solid choice.